House is located in the historic Sky Ranch area adjacent to the Sierra National Forest, home of the Nelder Grove Giant Sequoias and thousands of acres of high country to explore. We are conveniently situated - only minutes to Bass Lake and Yosemite’s south gate. 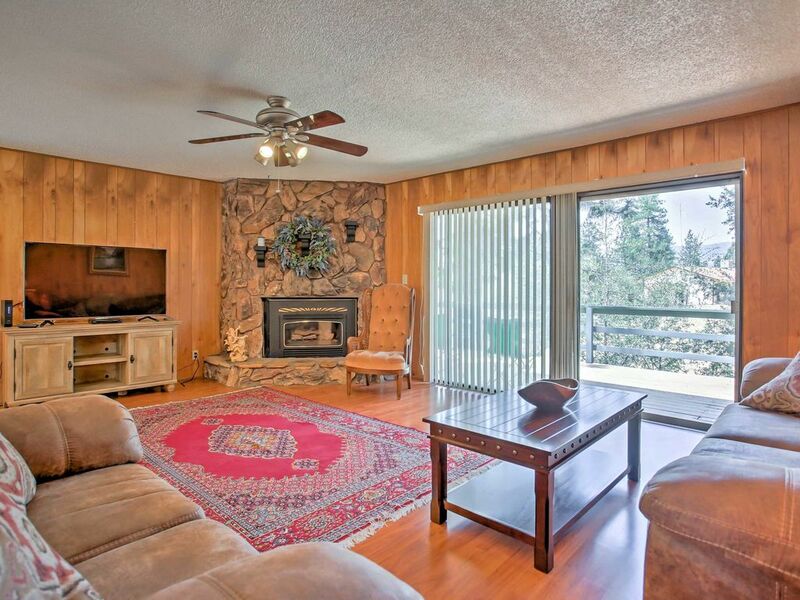 Lovely family area room with large gas fireplace, dining area, kitchen with peaceful garden window. Downstairs master bedroom has a vanity area with sink for a quick wash up. King size bed downstairs, upstairs bedrooms have 2 full size beds in each room. Soap shampoo and conditioner, towels, and kitchen is full of everything you need to cook whatever you want. The kitchen has stove, dishwasher, coffee maker and coffee. We provide paper towels, dish soap, dishwasher detergent, sponges, kitchen towels, and garbage bags. The kitchen is stocked with pots, pans, dishes, silverware, cookware, etc., you just bring the food! We have spices in the spice cabinet as well. The dining table is set for 6, available also 8 folding / outdoor chairs. We have a folding table that you can use outside on the newly built deck meal-times, to enjoy your meals surrounded by the beauty of nature. There are picnic chairs in the garage, feel free to take them outside on the deck area and use them. Grew up in San Diego, went to High School and College in San Diego, got my Engineering Degree in Electronics. My 9 year old daughter and 4 year son love outdoors so this house was perfect for us to enjoy the beauty of Yosemite. This house is big enough for large family, minutes from Yosemite, minutes from Bass Lake, minutes from downtown Oakhurst, plenty of parking, and the house is fully furnished. Property is easy to get to, 1 mile off Highway 41. October 2017 the deck completely remodeled. A very nice place. Loved the place. Everything we needed was there. It was close to every attraction in the area.. Thank you, Lee! Glad to hear you guys enjoyed your stay. The house is great. very close to Yosemite valley. The house is clean and has everything you will need for the trip. Nizar was great as well. he was very accommodating and helpful with what is good in the area for food, entertainment and site seeing. I would definitely recommended this house. Thank you Sara for your review and kind words, it was pleasure having you guys. We, a group of eight friends, all enjoyed our stay at this place. It was very clean and tidy. Everything provided us with showed the care and thoughtfulness from the owner. It is located close to the southern entrance of Yosemite National Park but very quiet and convenient. Supermarkets and restaurants are within less than 5 miles. We got from there more than enough for our next day trip to Yosemite. Much more impressed all of us was the prompt response from the owner whenever you called them and we got their help immediately. Thank you so much, Nizar, for all you have done for us! We definitely will let our other friends know this wonderful and comfortable place. Thank you very much for such a great review and your kind words. It was pleasure having you guys. Was well worth it. House was clean and comfortable. Very surprising to us that they thought of everything. Thank you, again. We will definitely be doing this again. Thank you, it was pleasure having you guys and am glad you guys enjoyed your stay. Am happy to hear you guys enjoyed your stay.